Langley technicians manufacture the Boilerplate Mercury spacecraft in 1959. 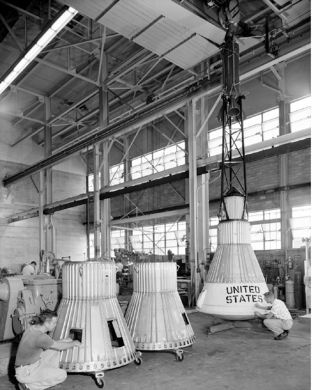 In this historical photo from the U.S. space agency, the Boilerplate Mercury spacecraft is being manufactured "in-house" by Langley technicians. The capsules were designed to test spacecraft recovery systems. The escape tower and rocket motors shown on the completed capsule would be removed before shipping and finally assembly for launching at Wallops Island. Design of the Little Joe capsules began at Langley before McDonnell started on the design of the Mercury capsule.